A hot Monday in Pimlico. 25th June. As London begins another ordinary week, a small selection of extraordinary young singers is about to embark on the Rodolfus Choir’s first UK tour. As members arrive from across the country and across the seas – one baritone flew over from Iceland! – new friendships are made, old friendships re-kindled, and the week is off to a brilliant start. In the uncharacteristic British heat, and the somewhat hidden spots of natural beauty throughout Southern Westminster, everybody was in good spirits - even after nearly 4 hours of rehearsal! And thus the day was filled with smiling faces (a relaxing afternoon break with ice lollies in St George’s Park did help!) looking forward to the tour ahead. On Wednesday we departed for Greystoke, Cumbria, with an 8-hour journey time including stops. I really don’t think that anyone was looking forward to it, but then there was no expense spared with the choice of coach: comfortable seats that don’t just recline but slide out into the aisle, working air conditioning (really that’s all anyone can ask for on a coach journey) and the loveliest of coach drivers. I even heard comments about how nice the bathroom was, though I didn’t venture to check it out. The hours quickly passed and, as we neared the 7-hour mark, the rolling hills of Cumbria began to engulf us. After a brief stop at some delightful services where the choir dined with some friendly ducks and enjoyed the stunning landscape around Tebay, we completed the last leg of our journey and arrived in the village of Greystoke. I’d like to say that the day ended there, but after we’d had some refreshments, we were shown to our various accommodation by members of the incredibly welcoming hosts of Henry Howard and his family. I wasn’t too sure what to expect as I’d been told to bring a sleeping bag and potentially a roll mat or air bed, oh, and also that I’d be staying in a castle. No big deal, Greystoke Castle only happens to be one of the family’s holiday homes. As the small group of us came around the bend of the half-mile long drive we were simply blown away. In the fading sunlight the pale red stone of the castle walls looked stunning. We unpacked in our rooms – one of which contained the bed that King George III was born in – and spent a good hour looking at the history hung on the walls throughout the building. There can be found old photographs of the Howard family through the generations, the signed document appointing Her Majesty Queen Elizabeth II to be 2nd Leiutenant of the Land Forces, and the original hand-written death warrant for Mary Queen of Scots. The day of our first concert began for me and my castle-camping compatriots with a small cooked breakfast overlooking one of the two lakes on the castle grounds before heading to St Andrew’s church for rehearsals. 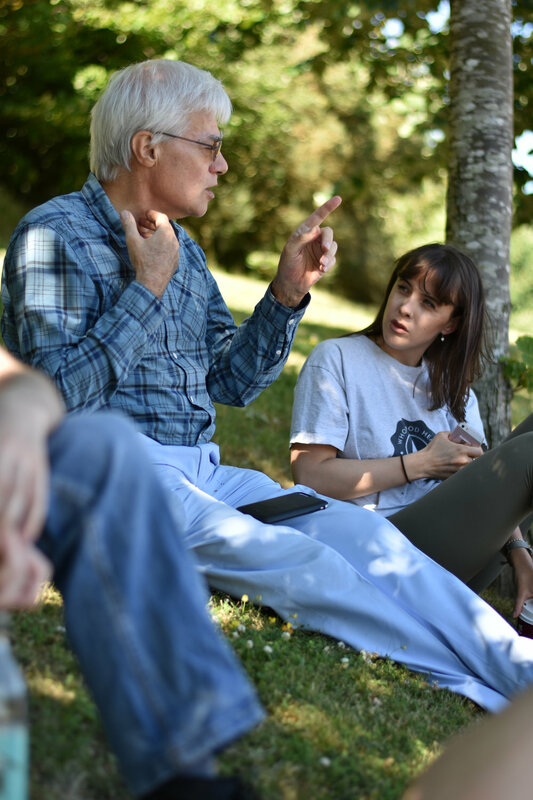 That afternoon, the group split to swim in the local swimming pool, take a leisurely stroll (or a “fast-paced walk” if going with our director Ralph Allwood) through the countryside, or just to relax before convening at the castle for a reception with friends and family of the Howards. We had a lovely time chatting with all sorts of people, some being former Rodolfus Choir members, in the idyllic setting of the castle’s back garden. Unfortunately, during all of this one of the singers was having a bit of a nightmare, specifically regarding a lack of black trousers for the concert! He was even more unfortunate when the delivery van drove straight past him and didn’t stop, despite him waving it down from the side of the road. He was about 5 minutes away from having to wear navy blue fishing overalls that were about 3 sizes too small when Ralph saved the day with his own pair of black pyjama bottoms (apparently they were snug as a rug too, so that’s good). That evening, we performed our first concert to a packed church; in my time as a member I don’t think there has ever been so much choreography in a Rods performance! From performing Lotti’s excruciatingly moving ‘Crucifixus’ in a large semi-circle behind the audience, to a number of Parry’s beautiful ‘Songs of Farewell’ scrambled in the round, to semi-rotating the choir from scrambled positions to split upper and lower voices for Elgar’s extraordinary bi-tonal ‘There Is Sweet Music’ either side of the audience. Nevertheless, the choir put on a fantastic performance. The whole evening was a great success with regard to entertaining, selling drinks and CDs, and most importantly raising money for the Hospice at Home and the Rodolfus Foundation. Following a jovial evening, the choir set off back to London on Friday morning. After a very short rehearsal in Pimlico, we all enjoyed a lovely dinner at Prezzo before catching up on some well-earned rest. The final day began with a nice long lie-in as the coach was set to leave for Thaxted, Essex, after midday. A final bout of rehearsals ensued upon arrival (a lot of which comprised figuring out our complex choreography in a different space), and time spent soaking up the rays with each other before the concert. A few of us found this quaint little windmill in a lovely little spot for picnicking where we sat and tried to eat an apple and cinnamon loaf without any cutlery – which was interesting to say the least! After another brilliant concert during which we sold all our supplies of CDs (solely down to the outstanding selling ability of the choir members, obviously), the choir enjoyed a very friendly but brief private reception before heading home. The choir are incredibly grateful to Ralph Allwood, Charlotte Mahony, Melissa Talbot, and Helen Bennett for making this tour such a success, and especially Henry Howard and his family, and Trevor Hounslow, Cavan Roberts and the festival team for their hospitality in Greystoke and Thaxted. It is sad that it’s all over so soon as we had all become quite close friends in the short time we’d spent together, but I’m already looking forward to next year. Very much a Kent local, Alexander was born and raised in Canterbury, where he attended The King’s School. He began playing keyboard at the age of 5 and from that point on took regular lessons in piano and singing, also pursuing his passion for singing through multiple choirs at school. 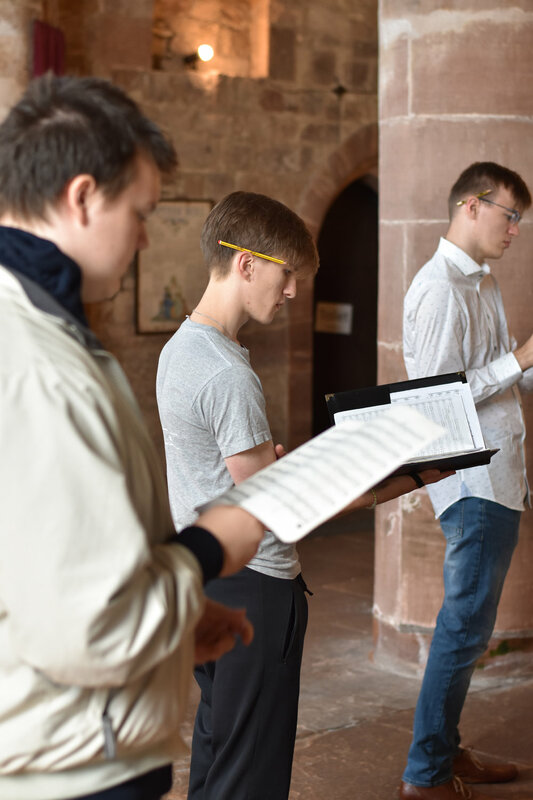 He took a gap year as a choral scholar at Portsmouth Cathedral, where his singing greatly improved, and he joined the Rodolfus Choir after singing with them and Philharmonia Voices in a couple of concerts at the Royal Festival Hall. 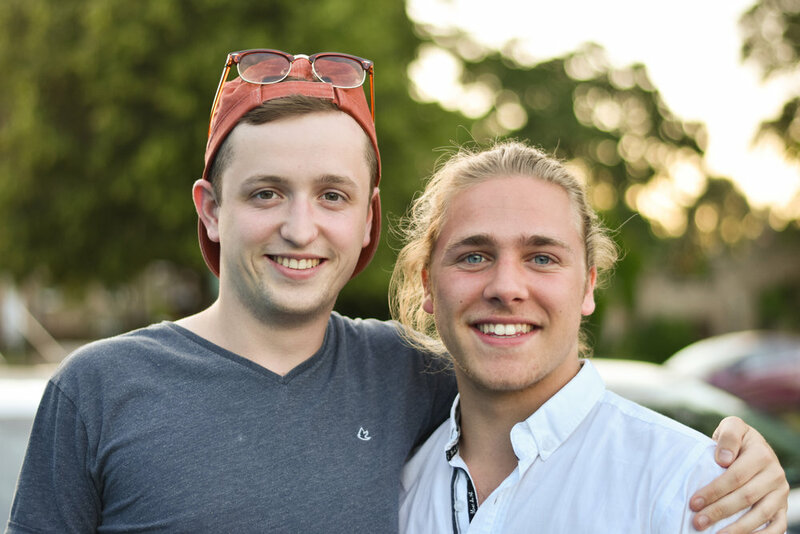 Currently an undergraduate Tonmeister student at the University of Surrey, Alexander can still sing with Rodolfus throughout the year through the many opportunities the choir provides. He also composes music; his soon to be published carol was premièred by the Rodolfus Choir in December 2017. 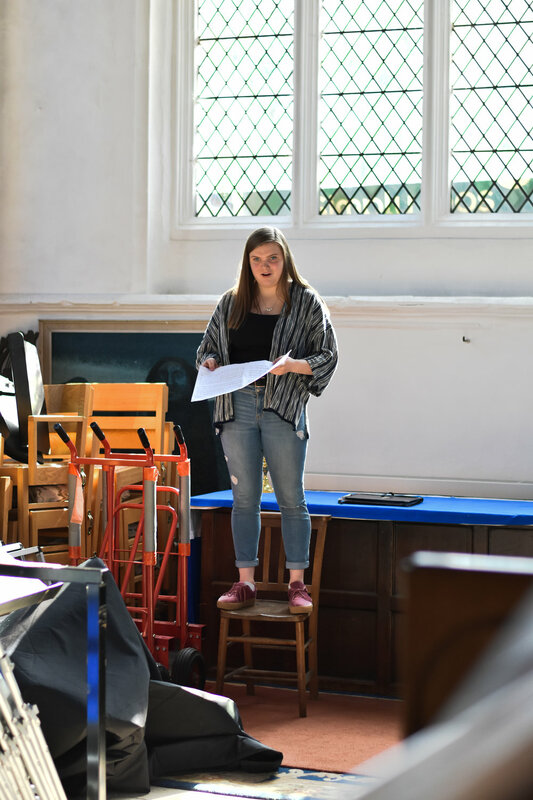 Becca started singing with The Rodolfus Choir in 2016, following participating on an Eton Choral Course. Since then, she has taken part in multiple events with the choir, including a performance of Ravel’s Daphnis et Chloé at the Royal Festival Hall with Esa-Pekka Salonen, and recording a BBC Choral Evensong. Being part of The Rodolfus Choir led her to apply for a Choral Scholarship at Queens’ College Cambridge, where she now studies Modern and Medieval Languages. She hopes to use her year abroad to explore more choral singing opportunities outside the UK.